Like the Romans, Creative Assembly have always built roads – poker-straight paths to conquest and good times. But they looked up from bricking their latest at the start of September to find that they’d made some minor errors in their calculations which, over miles, had led them off course. They hadn’t collided with any rivers, or forests, or mountains – but the road’s would-be walkers had been waiting to march down it for years, and demanded perfection. And so Creative Assembly have been worked their way back down their road for weeks, diligently marking their mistakes and re-laying the stones in their proper places. They’ve optimised their path finding. And there’s where the metaphor breaks down, really, because the other things they’ve fixed in Total War: Rome II all sound quite videogamey. 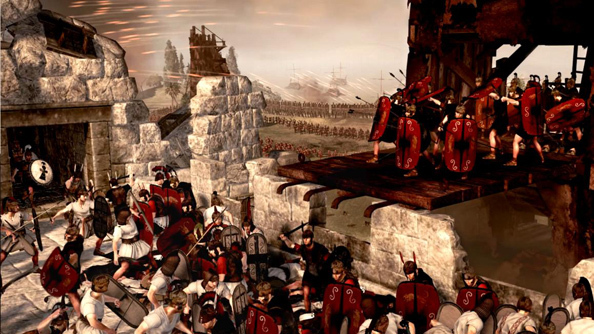 CA have put paid to a whole host of potential crashing scenarios – sometimes spotted when entering battles, declaring war, ending turns after changing unit size in the graphics options, attempting to deploy stuff in invalid battlefield locations, watching unit banners too closely, loading multiplayer land battles or deigning to let the AI take their turn. An indefinite hang, seen when attacking the Egyptian rebel army across the Nile, has been hanged by the neck until dead. They’ve also reducing CPU bottleneck and improved performance in a number of specific but important cases – for instance, when selecting units. More fruits of those labours will be apparent in future patches. Elsewhere, the AI has had a serious seeing to. It’ll now construct more military buildings and research better weaponry from earlier in very beginning of the campaign. You’re likely to spot slightly fewer ranged units in battle, and fewer completely worn out troops arriving at the feet of your units just in time to have their armour punctured. The AI will do loads new besides, too. Check the exhaustive, exhausting fullchangelogfor the rest.